Wednesday the 22nd of February was a pretty special day. It marked the KiwiHarvest HQ opening ceremony, when the hard work and dedication of the last year came to fruition. 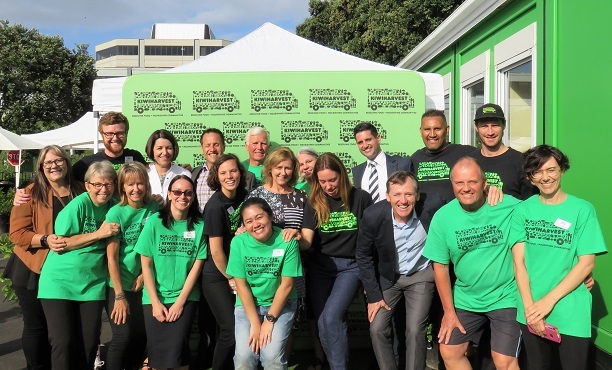 Built on a site owned by founding supporter – the Goodman Foundation, the container-based HQ will enable KiwiHarvest to continue and grow its good work in Auckland. KiwiHarvest collects good surplus food from supermarkets, cafes, growers and other suppliers in refrigerated trucks, redistributing it to social service providers who feed people in need. With this model, KiwiwHarvest has so far saved more than 250 tonnes of food from landfills, redistributing that food as 750,000 meals. The Mayor was joined at the KiwiHarvest HQ opening ceremony by John Dakin from Goodman Property NZ, and KiwiHarvest Chairman David Kirk and CEO Deborah Manning. They walked the green carpet with friends, supporters and volunteers, and enjoyed a breakfast of fresh rescued food and fresh hot coffee. RDT Pacific provided pro bono project management services, and RDT Pacific Project Manager Sebastien Kwan-Parsons was at the event to see the results of his hard work. In fact, the wider project team generously contributed their services to the charity, either pro bono or at greatly reduced costs. Macrennie Commercial Construction Project Manager Tim O’Leary and Quantity Surveyor Alex Mackenzie were invaluable to the smooth running and delivery of the project, as were Planning Focus, Holmes Fire, architectus and many other consultants and suppliers. The team at RDT Pacific is looking forward to this exciting new stage for food rescue in New Zealand, as KiwiHarvest expands to deliver more good food to nourish our communities.